Rajesh graduated from TKM College of Engineering, Kollam with Bachelor of Technology Degree in Mechanical Engineering. For the last 22+ years, Rajesh has lead complex and large ERP programs for Big 5s and other major consulting giants. 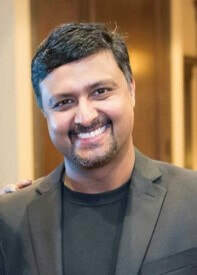 He is currently employed with Deloitte Consulting and is engaged in a major Oil and Gas S/4 HANA SAP implementation as their technology integration lead. He has proven as thought leader in delivering complex assignments and reviving troubled Programs. Rajesh loves arts and sports. He often attempts to paint, play and follow sports and spend time with his family and friends. He lives in Plano with his wife Sharmatha and two kids Aarish and Amrit.